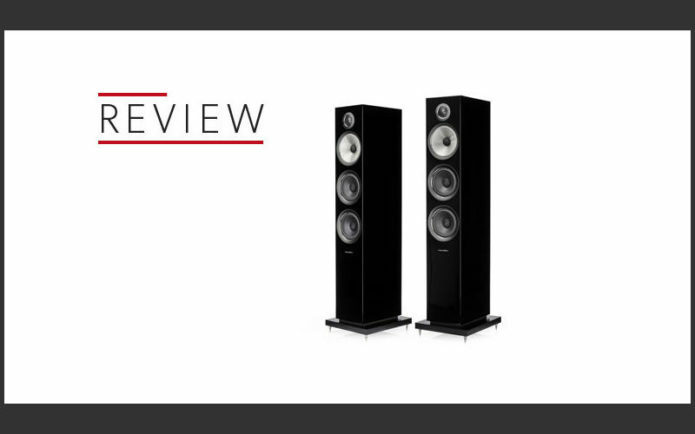 If you’re the kind of person that judges speakers by their engineering content, we doubt you’ll find anything more impressive at this price than the Bowers & Wilkins 704 S2s. Armed with the brand’s proprietary technology, the on-paper promise with these slim floorstanders is immense – and they mostly deliver. The technology highlight is the 13cm Continuum midrange driver. B&W has spent decades promoting Kevlar as the best cone material, so it’s a big thing that the company seems to be determined to replace it with Continuum as each range is renewed. But this isn’t some kind of U-turn. The new material simply builds on Kevlar’s controlled break-up characteristics and well-damped nature rather than going off in another direction. The material’s name is an obvious nod to that fact. We’re surprised and pleased to discover the 704 S2’s midrange also uses FST technology. Up to now we’ve only come across this in the company’s top-end products. FST replaces a conventional rubber surround with a specially designed foam ring. The foam is claimed to damp the resonances in the cone better, producing a cleaner, less distorted sound. The limitation of such a design is restricted cone movement, which is the reason it’s only used for midrange rather than bass frequencies. The 704’s midrange unit is also decoupled from the cabinet in a bid to minimise the negative impact of cabinet vibration. Move to either frequency extreme and you’ll find more new technology. Diamond dome tweeters – as used in the 800 series – are out of the question for cost reasons, so B&W has chosen to further develop its long running 25mm aluminium dome unit. This latest version adds a carbon coating on the 30-micron thick aluminium dome and further reinforcement in the form of a carbon ring. This gives the tweeter an extended reach with the first break-up mode happening at 47kHz, rather than 38kHz with the aluminium-only design. The tweeter is decoupled from the main cabinet for the same reasons as the midrange unit. The damped chamber behind the dome continues, and is there to absorb any rearward sound. Twin 13cm drivers deliver the bass. These use cones that vary in terms of thickness and rigidity along their profile in order to give the combination of damping and stiffness the engineers wanted. The bass output is tuned by one of the company’s dimpled reflex ports. The dimples are there to reduce noise and distortion. Take a step back from the technology and it doesn’t take long to recognise that these speakers are really well made. They feel solid with crisp edges and have a quality finish. Our gloss black samples looks classy, but if that colour doesn’t suit, there are satin white and rosenut alternatives too. These speakers are pretty heavy at just under 19kg, so don’t try to unpack them alone. Minimise the chance of damage (to you and the speakers) by getting some help during set-up. Finding the ideal position in our listening room isn’t difficult. We prefer the sonic balance with the speakers out into the room, and with a touch of angle towards the listening position. It might be tempting to place them close to a wall, but the bass frequencies become overbearing. The 704s are supplied with a two-stage foam bung to block the rear firing reflex port and reduce the amount of bass. The bung works, but the overall presentation loses some balance in the process. These are demanding speakers as far as amplification goes. Their claimed sensitivity is a perfectly reasonable 88dB/W/m, but take a close look at the tech specs and you’ll see that the 8ohms nominal impedance dips to a 3.1ohm minimum. That suggests an amplifier with a decent amount of grunt is needed, something like the Roksan Caspian M2 would work well as a starting point. This is made all the more important by the 704s only really coming to life at medium to high volume levels. At low volumes, the presentation becomes a little unbalanced and lifeless. It’s also worth bi-wiring as they sound notably more convincing when used this way. We give the B&Ws a weekend of running-in before listening seriously. These are impressive performers in many ways. The 704 S2s may be slim, but they deliver a bold, generously scaled sound that seems out of kilter with their physical form. Those twin bass drivers dig deep and give the presentation a pleasing degree of solidity and authority. These qualities come to the fore when we play Prokofiev’s Romeo and Juliet or Hans Zimmer’s Interstellar OST. With these pieces the floorstanders sound right at home, delivering a good level of detail with organisation and composure. They always sound in control, even as volume levels head upwards. There’s no sense of hardening-up or congestion as the music gets demanding. The stereo imaging is good, with instruments and sounds placed with precision. They stay locked into place during dynamic shifts too. Tonally, things are nicely integrated and balanced if the speakers are positioned properly and playing at medium levels or higher. At low levels, the bass is too slight for our tastes. We switch to a range of vocal-based material from the lovely Mount The Air from The Unthanks to Aretha Franklin’s classic, Dr Feelgood and the 704s shine. That FST midrange driver is excellent. Its delivery is agile and dynamic, rendering the nuance and texture of a voice superbly. If anything it’s a little too good, as the brilliance of the midrange shows up shortcomings at the bass end. The B&W’s bass is punchy and quick, but it isn’t particularly subtle or tuneful. Play Van Morrison’s Moondance and that distinctive walking bassline lacks delicacy and verve, sounding a little flatfooted through these speakers. The story is the same wherever the bass frequencies are required to give the music momentum and drive. It affects the way these speakers present the changing momentum of a piece of music and therefore the way they entertain. This has a knock on effect in the way these towers deal with complex rhythmic patterns, which come through as lacking in cohesion and stability. These things are not enough to stop us liking these speakers or appreciating their many talents. But, they’re enough to prevent the B&Ws being the superstar their ingredients would suggest, and that’s a bit of a shame.